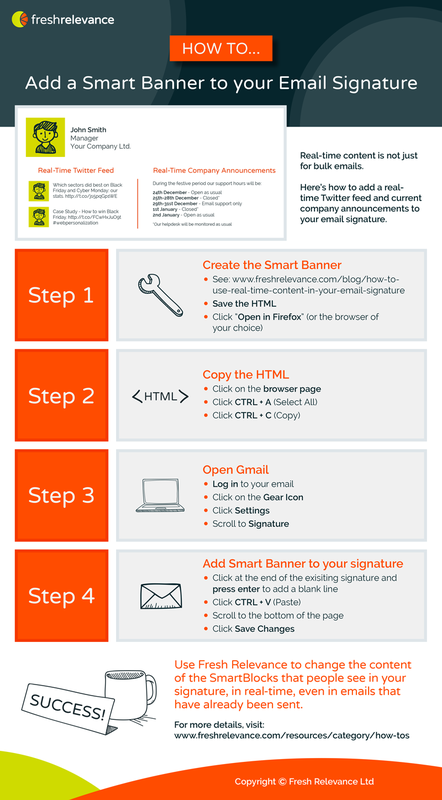 Create a Real-Time Signature block, see: https://www.freshrelevance.com/blog/how-to-use-real-time-content-in-your-email-signature, save as an HTML file and load in your browser. Click on the browser page and press Ctrl+A and Ctri+C. Open Gmail, click the gear icon, then settings. Scroll to your signature, add a blank line at the end and click Save Changes. Afterwards, you can use Fresh Relevance to change the content of the Smart Blocks that people see in your signature, even in emails that have already been sent.